When chef Missy Robbins left the restaurant world in 2013, the New York food media lamented the loss, but it was a short hiatus. She returned less than three years later with the Williamsburg restaurant Lilia, an Italian joint that has been praised by critics (it received a coveted three star review in The New York Times). The time off led to a personal journey that gave her time away from the taxing world of restaurant cooking to focus on her health and family, as well spend time traveling and cooking for herself, all of which ultimately led to her decision to open her own restaurant. She chronicles this journey in her new book, a cookbook-memoir hybrid titled Breakfast, Lunch, Dinner…Life! Recipes and Adventures from My Home Kitchen, out September 19. After 20+ years toiling in the kitchens at Spiaggia and A Voce, Robbins, at age 42, discusses her first restaurant project on her own and rediscovering of food through a healthier lens. The charming and welcoming chef, who recently moved to Williamsburg to be closer to Lilia, chatted with Domino about the book, how she stays healthy, and her favorite go-to recipes. What made you want to write this memoir/cookbook? I was cooking a lot at home during my time off, and these are the recipes (except for the travel stuff) that represent what I cooked at home and with friends. It was a natural progression for me to write this book. The idea started before Lilia was conceived, and I wrote a good portion of it right after Lilia opened. I thought I had a story to tell based on my own experiences of trying to find balance and better health. I hope that the stories and the recipes alike inspire people. How did you decide to embark on this personal wellness journey? What caused you to take a step back? I was at a point in my career where I had never taken a significant amount of time off and the timing felt right. I wanted to figure out a new path and didn’t exactly know what that meant at the time. The health really came from me feeling terrible. I was overweight and wanted to get in shape. It was an easier thing to commit to when I was out of the kitchen full time. The deeper into I got, and the more weight I lost; I just felt good, and it has now become a part of my life and a priority. How has getting healthy (in an industry where that seems impossible) changed your attitude towards eating, cooking, and being in the kitchen at Lilia? I have learned to balance my life and that helps me to stay healthy in mind and body. It keeps me more focused and has made me a better leader because I am happier. My cooking has definitely changed in terms of fat content and what I am cooking. While Lilia is known for pasta, there is huge focus on vegetables and fish. That comes from my own personal diet. I have trained myself to taste food in a different way so I’m not overeating anymore, but can have a pulse on feeling consistency in the kitchen. 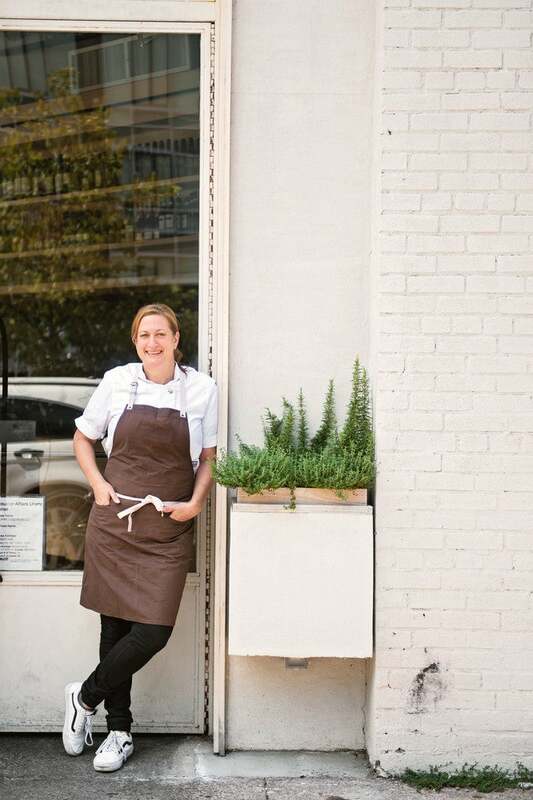 How is the return to the hectic kitchen at Lilia going after this new focus? It has been great. I love having my own restaurant. I have created a home there for my staff and our guests, and it is very different than just being an employee. I have an amazing business partner who shares my vision and an amazing team who allows me to be both a chef and a business person. It is really a huge joy in my life. Tell us about your fitness and beauty routine. I have been doing Pilates for the past four years, and I am trying to run, but I’m not that good at it…yet. I used to go to Uptown Pilates in the West Village. I now work with my same teacher at a private space in Williamsburg and occasionally still go to Uptown. Her name is Michelle Jongeneel. She’s amazing. I work very hard at my eating habits and maintaining a healthy weight. I have found it’s all just about balance and eating a ton of vegetables. In terms of beauty, I’m a pretty simple girl. I go to Primp and Polish in Williamsburg or my old favorite, Ku’s in SoHo for regular pedicures. What are your favorite healthful foods and ingredients? Do you still enjoy pasta and desserts? I eat a lot of fish now and a lot of vegetables. My go-to dish is always some sort of fish lightly braised in tomato sauce with chickpeas and broccoli rabe. But, yes indeed, I still eat pasta and pizza—just much less at a time than I used to (and ice cream is my biggest vice). What about from the restaurant? That is like picking a favorite child! The menu at Lilia is very close to my heart. I put things on the menu that I would want to eat at home, but elevated slightly. Three of my current favorites are salted anchovies, salsa verde, and butter; turbot, lemon truffles; and whole roasted summer squash. But really I love them all—that’s why they made it into the book. What are your favorite bookstores in the world? I love McNally Jackson in SoHo and Three Lives in the West Village. Bonnie Slotnick has always been a favorite for old cookbooks (I have a very large cookbook collection). I’m also a big fan of wandering the chain bookstores in Italy to find Italian cookbooks that we don’t see in the states. I just received three in the mail today, all from different regions of Italy: Sicily, Acquatta, and Naples and the Amalfi Coast. What are the cookbooks and recipes you keep coming back to? The Splendid Table, The Encyclopedia of Pasta, anything from The River Café, The Time Life Series, and Seven Fires. Favorite thing to cook at home for dinner? Roast chicken or very simple pastas. But honestly, I don’t have a lot of time these days to cook at home. Favorite NYC restaurants aside from your own? Lucali Pizza, I Sodi, and Uncle Boons.